Log Cabin House Plans are popular, in part, because of our connection with the history of the log cabin. This is only a slight variation on how the early settlers built their cabins. In the northern reaches of Europe, where trees continue to outnumber people, the style remained popular until modern times. It was the Finns who brought it to America. Finland was then under the sway of Sweden, and Finnish settlers brought the style with them to New Sweden, a short-lived colony in North America. 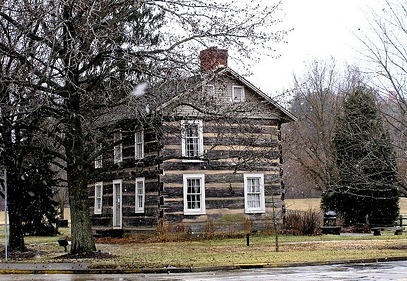 The log cabin outlasted the colony and it was picked up by other settlers. The Eastern seaboard had no shortage of trees. The early settlers had their choice of trees and needed to fell lots of trees in order to plant their crops. It was certainly not the only style of house built, but it was popular along the frontier. Cabins tended to be small, appropriate for someone who needed to put most of their energies to clearing land and farming. As an area became settled the cabins tended to be either replaced with fancier accommodations or upgraded with siding and plaster so that the logs were no longer apparent. With the advent of mass production and steam-powered sawmill's lumber replaced logs as the building material of choice. Why log homes came back is not entirely clear. Perhaps it was the hold that the log cabin had on the American psyche. It represented our ideal of the frontiersman, independent, fierce-willed and carrying on in the face of adversity. At first it just clung on as a form of country retreat. The rich might build a log cabin for a hunting camp, and since they were rich, some of these log cabins were impressive structures. Consider Woolaroc, the country retreat of oil man Frank Phillips. It wasn’t just a place to while away the hours between hunts. It was fit for entertaining business associates and dignitaries. 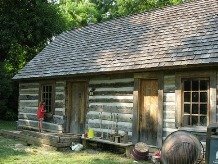 You can still see that "log cabin" today, if you visit the Woolaroc museum in Osage County, Oklahoma. 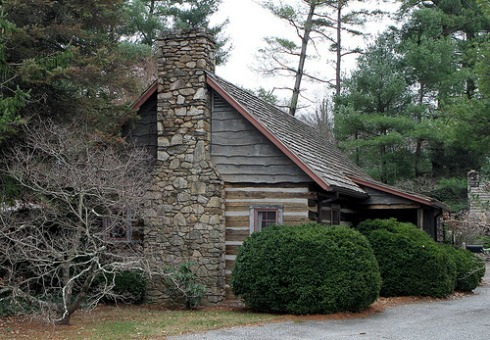 The log cabin gained a boost in popularity when the National Park Service adopted it as an official theme for all of its park offices. 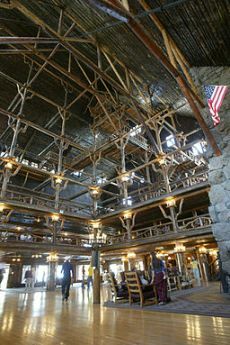 This came about because of the popularity of the Old Faithful Inn at Yellowstone, designed by architect Robert Reamer and completed in 1904. Originally boasting 120 rooms it has been expanded many times till it now exceeds 300 rooms. 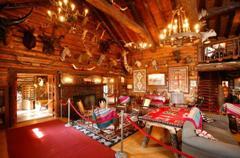 Log homes continued to be hand-crafted affairs up until 1923. At that point a Maine lumberman named Bruce Ward set up a mill to start producing log homes on a mass-production basis. He had built his own cabin the old-fashioned way, but he had so many friends ask him to build a home for them, that he realized he could expand demand for his lumber if he found a way to make the cabins available across the country. 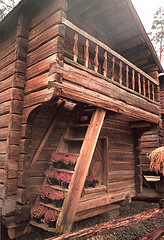 He would mill the logs, assemble a home at his mill, then disassemble it and ship it to his customers. This practice remains the industry norm. A square profile milled log with grooves to position the log, keep it from warping and eliminate drafts. Bruce continued to innovate and introduced tongue and groove logs. No longer were logs just resting on each other. They actually interlocked. Now if a log warped there would be no open seam to the outside. The tongue and groove also prevented warping from side-to-side, the main direction of warping, since the weight of logs above usually kept logs from bowing up. In the 1960’s there was a surge in the popularity of log cabin house plans. It was a reaction to the standardization of suburbia and a way to connect back to nature. The number of log home manufacturers expanded and log cabin house plans moved into the mainstream, as it became increasingly used as a principle home rather than merely for summer homes. Somewhere along the way milled log homes changed from being simple cabins to being full-sized, modern houses. While most still have a rustic look, almost any style can be built with log homes. However they also lost some of their charm, as logs became so milled that they started looking less like logs and more like lumber. However, with dozen of manufacturers of these homes you can still find some that produce a natural look, or you can still have your log home handcrafted.